Be honest. How many pairs of shoes do you own? It’s OK, nobody’s judging. We understand better than most just how addictive shoe shopping can be. But we don’t just want to know how many of you are hoarding the heels and stockpiling the sandals. 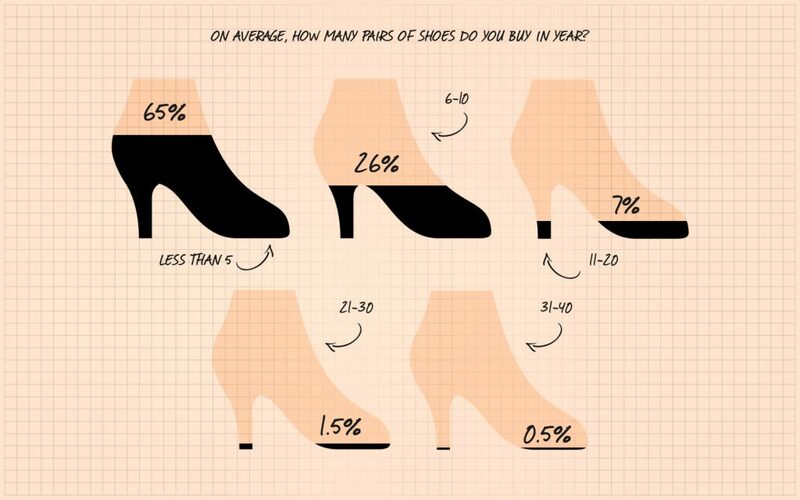 We want to know how many of your shoes you actually wear, and how much you’re spending on them. Are the stereotypes true? Do most UK women buy shoes only to keep them in boxes, never to be worn? So, how many do you own? The majority of our ladies told us their shoe collection consists of 11-20 pairs, with 40 per cent giving this figure. Meanwhile, just over a fifth of women reported owning a sizeable selection of 21-30 pairs, which should safely see them through any occasion known to (wo)man. 10 per cent of our ladies own a whopping 31-40 pairs of shoes, and just under five per cent are harbouring up to 50 pairs, leaving us suitably impressed at their commitment to footwear variety. 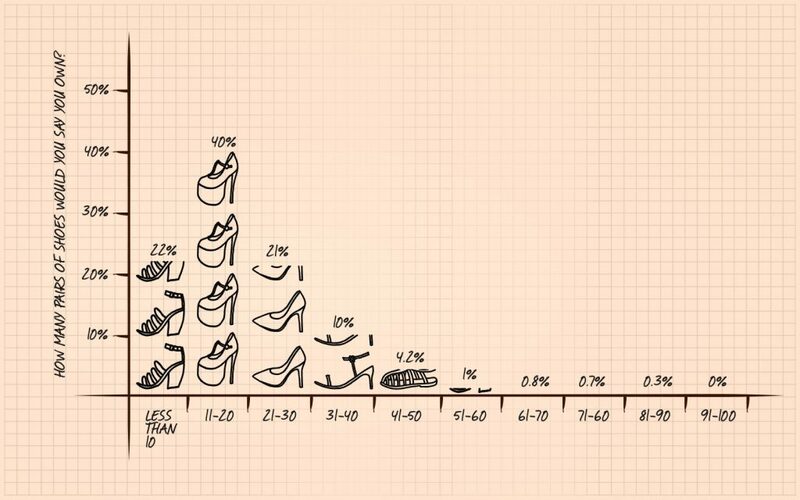 On the other end of the scale, we found that a surprisingly large proportion of women (a fifth to be exact) own a much more conservative 0-10 pairs of shoes. 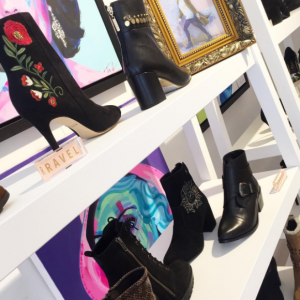 Whether due to a lack of interest, a smaller budget or simply a storage issue, these cautious shoe shoppers certainly challenge the ‘women are obsessed with shoes’ stereotype. But how many do you wear? 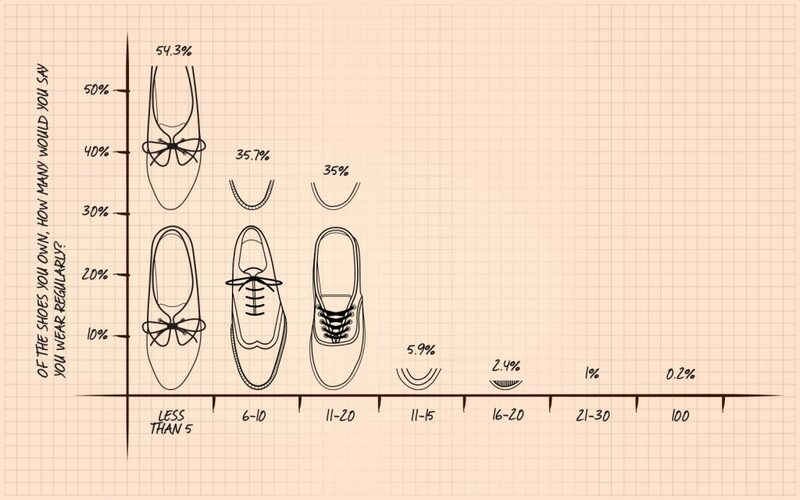 So, we know that the majority of women own anything between 11 and 30 pairs of shoes, which is a hefty number. But we wanted to dig a little deeper and find out how many of these shoes ever actually see daylight. If you can believe it, over half (54 per cent) of our ladies admitted that they wear fewer than five pairs from their shoe collections on a regular basis. So for the average 21-shoe collection, that’s less than a quarter making it out of the wardrobe. The second largest proportion of the women we surveyed (35.7 per cent) said they wore 6-10 pairs out of their collection regularly. This still only amounts to around half of the average shoe collection. 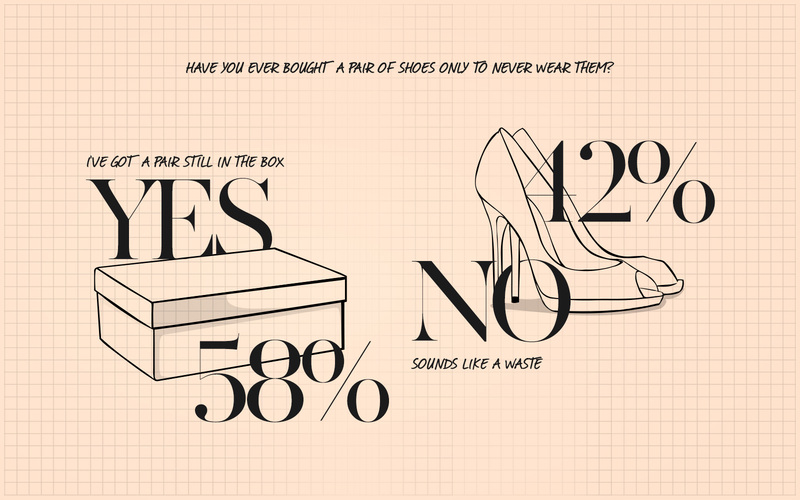 We also asked if anyone had ever bought a pair of shoes only to never wear them. An astonishing 58 per cent answered yes, they’ve still got at least one pair of shoes they haven’t even taken out of the box, let alone worn. That’s the reason most women gave for neglecting a large chunk of their shoe collection. 59 per cent say the main reason that stops them from wearing certain pairs of shoes is that they’re simply too uncomfortable. We’ve all been there. It hurts to wear them, but it hurts even more to accept the fact that we can never wear them again. The second biggest reason for so many shoes going un-worn so often is a very practical one: They’re seasonal. 38 per cent of our ladies said seasonality plays a big part in how often they wear certain pairs of shoes. And that’s absolutely fair enough; we wouldn’t wear strappy sandals in the depths of winter either. After seasonality, our survey revealed that struggling to match a pair of shoes to an outfit is the third biggest reason why some get abandoned, with 16 per cent of the vote. Sometimes a pair of shoes will steal your heart on first sight, but they simply don’t go with anything in your wardrobe. It’s a sorry state of affairs, but it happens. 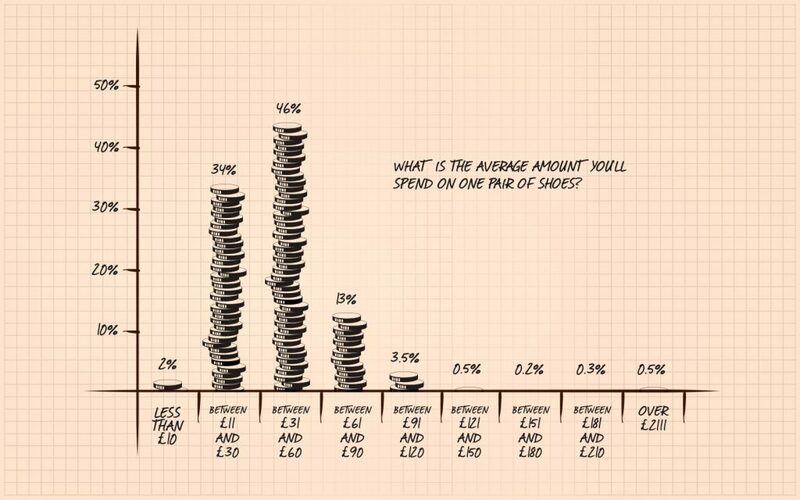 So with well over half of women admitting to never even wearing some of the shoes they buy, we were curious to know just how much is being spent on them in the first place. Our survey revealed that the majority of women (65 per cent) buy fewer than five pairs of shoes in a year, and the highest proportion (46 per cent) will spend between £31 and £60 on each pair. On the whole, we’ve found that the average UK woman will spend roughly £250 per year on new shoes, with each pair costing on average £45. So, if we take our average woman owning around 21 pairs of shoes and only wearing 5 of them regularly, we’re potentially looking at a staggering £720 worth of shoes gathering dust at the bottom of the UK’s wardrobes. So it appears that the stereotypes do have an element of truth to them. Over half of women do in fact spend lots of money on shoes, only to keep them in boxes with no intention of wearing them. But really, where’s the harm in that? If you want rows and rows of beautiful shoes that you’d rather keep in perfect condition, then that’s your prerogative. 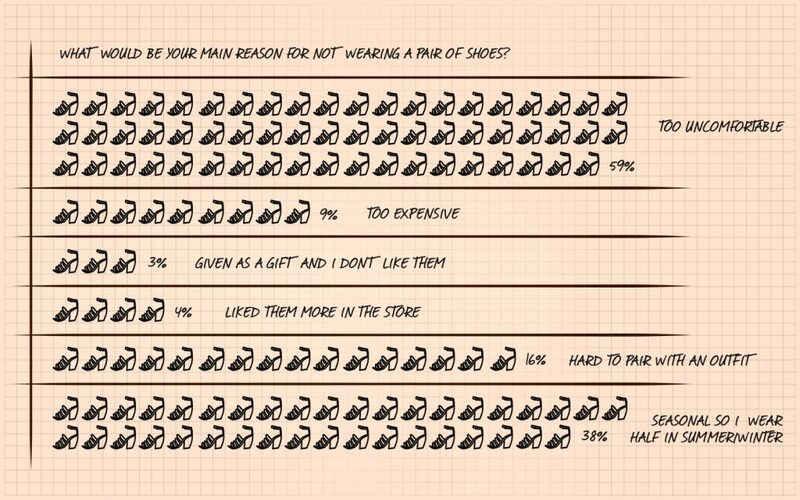 In this survey, we asked 1626 females a series of questions on how many shoes they own, how many they wear and how much they spend. To retrieve our data, we gave each participant a multiple-choice survey which they could use to select the most appropriate answer based on their shoe collection and buying habits.